Free State troops fire on the Four Courts. Did British gunners also bombard it? 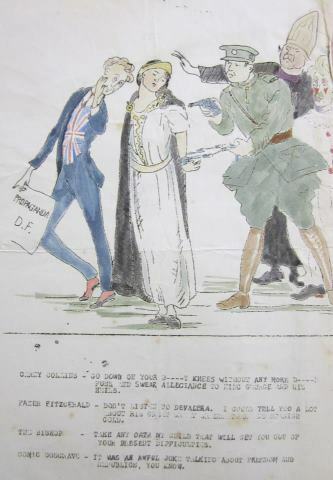 In recent weeks, (November 2012) there has been a flurry of controversy over the recovery, in the Imperial War Museum Archives, of a memoir by a British artilleryman who claimed his howitzer fired the opening shots of the Irish Civil War. Lance Bombardier Percy Creek, Royal Field Artillery,’s unpublished memoir, found by historian William Sheehan, recalled that his unit, stationed in Fermanagh – presumably to take part in the fighting there between the British Army and the IRA units in control of the villages of Pettigoe and Belleek, along the new border with Northern Ireland – was sent to Dublin. The ‘border war’, fizzled out by late June 1922 as a crisis within Irish nationalist ranks erupted in Dublin. 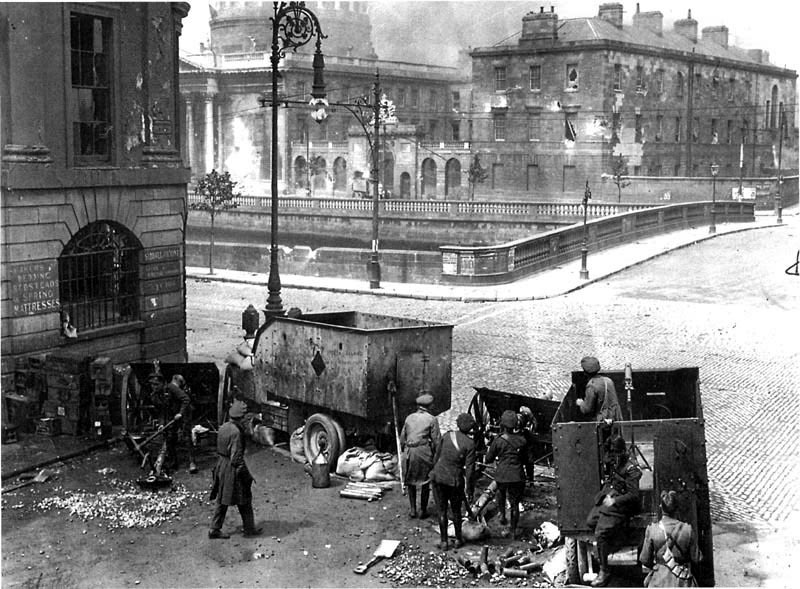 The Four Courts which had been occupied since April by anti-Treaty IRA elements, was being attacked by the troops of the Provisional Government under Michael Collins. Creek wrote later that he was told to march by night to Dublin and “told not to speak to anyone and to keep as quiet as possible”. His unit waited until they were given the orders to fire, before unleashing two heavy artillery shells at the Courts. “[We] then saw the shell rip into a wall of one of the courts. Then, all became quiet and I think the officers and dignitaries were all very tense”. “We only fired two rounds and quickly limbered up and went back to the rest of the battery,” said the First World War veteran, who described the situation in Dublin as “very tricky”. Creek recalled that his sergeant and commanding officer were worried beforehand because of the presence of Irish soldiers in the Royal Field Artillery unit: as, “The Irish are temperamental people,”. Creek appears to have been under the impression that the building had been occupied by dissident Black and Tans, rather than anti-Treaty fighters, but the political situation was confusing and Creeks, in any case was but a humble enlisted man. In any case; “A few days later we went to some docks and the whole battery was shipped back to Fishguard”. Creek’s account may or may not be verified but why is this claim still controversial today? The Irish Civil War continues to be an emotive subject and those with family or ideological connections with the pro-Treaty side do not like to see the republican allegation of the time – that the pro-Treatyites were merely acting as a proxy for Britain – bolstered. Tom Barry later alleged (taking rather large liberties with the truth), “Another thing that made our [anti-Treaty Republican] position impossible was the build-up of the Free State Army from the Irish regiments of the British army. They had been disbanded as part of the Treaty arrangements and sent back to Ireland. The Royal Munster Fusiliers, the Leinsters, the Dublins , the Connaught Rangers, all these regiments were disbanded at Oswestry in Wales , they were put into civvies and sent across from Holyhead to Ireland, where they were met by Free State lorries and brought to Beggar’s Bush barracks and put into green uniforms. The ‘Free Staters’ were sensitive to this charge both in 1922 and later. Pro-Treaty soldier Niall Harrington “It was charged… that the authorities accepted into army service men who had served in the British forces. This is true of course and such men were entitled to join and serve in the National Army…It would be totally untrue to charge that recruits were accepted from the British forces”. After all, many on the pro-Treaty side, indeed perhaps the most ferocious of them, fought the civil war believing themselves to be the true republicans and that those fighting against them were traitors to Ireland and indirectly helping the British by undermining the new Irish state. But is it really so surprising that British troops participated in the Irish Civil War? By late June 1922, most British troops had been evacuated from Ireland but there remained a number of garrisons in the country. The largest of these was the 6,000 strong force stationed in Dublin’s Phoenix Park under General Neville Macready, who were to stay until a year after the signing of the Treaty (December 6, 1922), to make sure its terms were implemented. We know that British government pressure effectively forced Collins and the Provisional Government into opening fire on anti-Treaty forces in the Four Courts. On the 22nd, a retired British General, Henry Wilson, who had been the military advisor to Northern Ireland, was assassinated in London by two IRA men. Winston Churchill assumed that the anti-Treaty IRA were responsible and ordered the British garrison in Dublin to attack the Republicans ensconced in the Four Courts . On the urgings of Neville Macready, the British commander in Dublin, the plan was cancelled at the last-minute and Collins’ government was given an ultimatum to re-take the Four Courts or have British troops do it. It has always been accepted that Collins used British 18 pounder guns and ammunition for the Four Courts attack. It is also on record that Churchill also offered a 60 pounder howitzer and to bomb the Four Courts from the air, but Collins turned him down, fearing heavy civilian casualties in the densely populated inner city area . It is not implausible therefore that the howitzers were indeed used to blast holes in the Four Courts’ thick walls, as Creek’s memoir implies, to open the way for the infantry assault. Moreover, in the further week’s fighting in Dublin that wrested the Irish capital out of the hands of the anti-Treaty IRA, at least one British soldier was killed and more wounded, indicating that they took at least some part in this fighting too. What all of this shows us is that the British were not neutral in the Irish Civil War. There had been violent clashes and shots exchanged already between Irish pro and anti-Treatyites before June 28, 1922, notably a day-long gun battle in Kilkenny city in May, but it was British pressure that ignited all-out civil war. Moreover the British were determined that one side, the one that would honour the Anglo-Irish Treaty would win. They supplied that side with the arms, including heavy weapons such as artillery, armoured cars and aircraft and enough money for an army of 58,000 to be maintained by the Free State by the end of the war. They were also prepared, should the anti-Treatyites have gained the ascendancy, to re-deploy their own troops into the conflict. Indeed at one point, in September 1922, when due to the IRA’s guerilla campaign, large parts of the countryside seemed to be passing out of Free State control, British commander Neville Macready was reporting back to London that it was a question of “when not if” British military intervention would be needed . As it happened wholesale use of British troops did not prove necessary to defeat the anti-treaty forces. But British troops did indeed see action in the 1922-23 conflict on a number of occasions. Anti-Treaty IRA Dublin Brigade commander, Frank Henderson reported to his superior Ernie O’Malley on August 30, 1922 of Free State and British Army cooperation to foil an attempt to isolate Dublin by destroying roads and bridges around city on Aug 5-6, in which operation 58 anti-Treaty fighters were captured. However, by October 1922, Henderson was reporting that British troops, while still present, were no longer actively aiding Free State operations. “Re the activities of the British, they appear to be inactive at present. They are simply doing nothing but holding on. They generally help F.S. [Free State] if they happen to hear about an ambush taking place. Re Collinstown [now Dublin airport], the British are still there and a convoy consisting of two double turreted armoured cars and a motor lorry goes into the city and returns back [sic] at least once a day. The convoy was ambushed several times before armoured cars accompanied it.” The British were also training Free State pilots in the aerodrome. To the British this policy of giving as much military help as necessary, but no more, to the Free State was logical enough. There was a curious convergence between their position and that of the anti-Treaty republicans – that the Free State was to be a loyal dominion of the British Empire and that it was putting down, ‘the irregulars’ on their behalf. Symbolism, in the form of the Oath of Allegiance to the British monarch that Irish parliamentarians would have to take, was important to anti-Treatyites, but also to the British. It would have humiliated the Empire to grant an independent Irish republic and to admit defeat. Given the military aid, direct and indirect that the British were prepared to give, the Irish Civil War could only have ended one way. 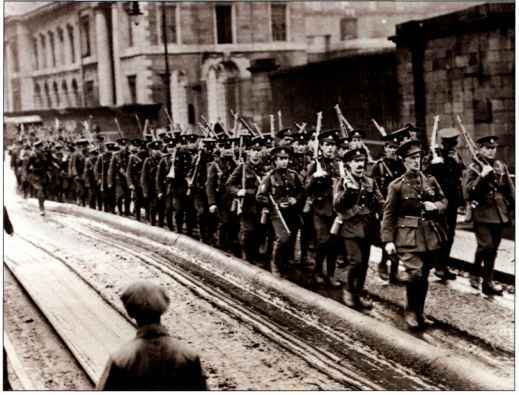 British troops depart from Dublin’s North Wall in December 1922. But one of the discordant features of the Irish Civil War is that many pro-Treatyites, allegedly those who were doing Britain’s bidding, did not see what they were doing in the same light as their British allies at all. There were indeed some people in the country who supported the Free State on what we might call, ‘pro-Imperial grounds’, for instance at the meeting of the Louth Farmers’ Union to discuss the Treaty in January1922, one William Russell, who represented the ‘large commercial community’, argued that he was ‘proud to be associated with the British Empire’ as a, ‘Republic would mean we would be foreigners in the Empire’. A Major Barrow (‘just back from India’) told the meeting that, ‘remaining in the Empire gave Ireland all the advantages of belonging to a big firm’. But Pro-Treaty republicans, who were at the core of the Free State’s Army and Police (Richard Mulcahy and Eoin O’Duffy, for example, respectively heads of the Army and Garda, had both been senior IRA officers), argued that the Treaty was merely a ‘stepping stone’, Michael Collins’ phrase, to the Republic. Cooperation with the British may have been accepted as tactically necessary during the civil war but there were limits to their willingness to cooperate with their former enemy. David Nelligan, who had worked within the Royal Irish Constabulary for the IRA in 1919-21 and by 1923 was head of Free State Intelligence and then Garda assistant commissioner. On an intelligence-sharing meeting with his British counterparts in 1924, they talked about potentially subversive communist activity of mutual concern, but when the British asked about ‘ the irregulars’, Nelligan answered simply that, ‘things are quiet at present’, and refused to share more information on the IRA or any other Irish political organization on either side of the Treaty divide. There were, in short once the civil war was over, limits on the pro-British sympathies of the ‘Free Staters’, regardless of what republicans alleged. Nevertheless, examination of evidence, old and new, on the Irish Civil War shows us that it was not only ‘Green against Green’, but that the British military might, both indirect and, on occasion, direct, was deployed to all but guarantee victory for the pro-Treaty side. That this was so does help to explain to some degree how the pro-Treaty party’s line that they were defending democracy and the ‘people’s rights’ on the Treaty was never entirely accepted and why they were ultimately to be eclipsed politically by the resurgent anti-Treatyite nationalists of Fianna Fail after 1932. Kenneth Griffith and Timothy O’Grady, “Curious Journey: an oral history of Ireland’s unfinished revolution” (London 1982), pp. 299-300. Irish Times, November 5, 2012, Mark Hennessy, Four Courts Still in Headlines, 90 Years after Attack. Written by: John_Dorney on 25 November, 2012.on 28 June, 2017. 25 Responses to "British Military Involvement in the Irish Civil War"
My answer to the rest of the article are as follows with documentary evidence written at the time. clearly showing that Tom Lawlor was asked could he hit the Courts with a 60 Pounder, the answer was, ‘If he didnt, he would get it damn near’. On that account, the 60 pounder offer was refused outright. (Parraig O’Connor Papers). This article still fails to offer proof that British troops were involved in the bombardment of the Four Courts, but more to discusses the ‘Minutes of British Debates and Offers’ to the Provisional Government at this time, and also British Troop movement about the place during the Civil War. The British army were not under siege at the time and could go to their various barracks around the city. James, the article does not seek to offer proof on Creek’s memoir, just to point out that (a) it is very possible and (b) the British military did get involved in various ways in the civil war. And that overall British military backing effectively decided the result of the civil war. Re O’Connor the date of the shooting at Trinity was on June 4th 1921. As the article states, almost exactly a year before. My only query on the Sheehan claim is to wonder why, with 6,000 British troops in Dublin, they had to march men overnight from Fermanagh to attack the Four Courts? Probably because those 6,000 were infantry whereas the artillery units they wanted, with the 60-pounder guns, were up in Fermanagh after being involved in the Belleek-Pettigo battle. Those units had originally landed in Belfast in early June (there’s pics on the Belfast Telegraph website) then gone by train to Enniskillen. Do you think its a possibility then? Black and Tans in the Four Courts? I can understand a soldier being confused about who was who in 1922 but Sheehan can’t have missed the rest of the Civil War entirely can he? The evidence of British military support for the Treatyites is overwhelming without a literal ‘smoking gun’ anyway. I think that the use of a 60 pounder gun to fire two shells and open a breach in the Four Courts is possible, yes. Why not? We know the British were pressing Collins to take the howitzers. But as you say, my point is that the British troops were indeed subsequently deployed in the civil war on occasion. So why would this be so surprising? Really nothing new. It was in the British interest that the pro-treaty forces prevail. The southern Irish infantry regiments within the British Army were disbanded with the free state treaty. Many Irish soldiers either opted for other regiments within the British army or jouned the free state forces which was the legitimate government.of southern Ireland. This was a bitter period in Irish history where brother fought brother. Michael Collins was a pragmatist and took what he could. At the time of the rebellion the British were winning but at a terrible cost. Britain was war weary and sick of the bloodshed. Michael Collins took the best deal he could at the time. The Civil War was a counter-revolution, The Pro-Treaty side basically said “That’s enough revolution. Let’s put bounds on this Nation’s march”. Some elements of the anti-treaty side wanted to go a lot further (Democratic programme of the first Dáil) and create a radically different Ireland. Neither the Brits nor the Irish bourgeoisie wanted this sort of social revolution. The winners of the Civil War wanted, basically, to replace the Brits and take over the pre-existing British state in Ireland. Guess who the Brits supported, as the best of a bad bunch? The Democratic Programme was taken up (and written up the night before the first Dail) as a sop to Labour for not contesting the election. Current Republican vogue for embracing all causes Left-wing not withstanding, the Sinn Fein of 1919 and its supporters saw things in Nationalist, not social, terms. Labour was on a movement running parallel to the Nationalist one but rarely overlapping. That the supposed counter-revolutionaries in the shape of Fianna Fail did nothing to overturn the system when they finally got into power suggests that Nationalists were perfectly happy with the way things were, they just wanted Ireland run for the benefit of itself, not for Britain. The article was not about the social aspect of the revolution for a start. The article was simply about how in fact British military presence in and aid to the Free State effectively decided the civil war (whether or not there was smoking gun at the Four Courts). However, SF in 1919 grew in areas with the most land agitation and the most land hunger, the west and north midlands, ‘the land for the people’ was and remained a key part of nationalist politics. Both sides of the Treaty split knew this and in 1923 both appealed to agrarian radicalism – the pro-Treatyites by enacting a land act, buying up the remaining landed estates – on which contrary to recent truism lived up to 100,000 families or in the region of half a million people. The anti-Treatyites in FF radicalised this when they came to power with various internal colonisation schemes moving farmers in poor regions to good land in places like Kildare and Meath. It’s very far from true that nationalist were ‘perfectly happy with the way things were’. Regarding labour, labour up to 1922 was central part of the republican ‘front’, they cooperated to run most rural and urban councils. Thereafter they parted ways, labour being basically if not avowedly pro-Treaty. I’d agree the strikes and ‘soviets’ of those years were not revolutionary but again it’s just not true to say that social and economic issues were not important. Further to this FF did actually implement many new social policies – house building, state industries, etc when they got into power. Whether all this is ‘left wing’ is debatable though, rather it was central to the separatist and republican politics of teh early 20th century as advocated by the likes of Arthur Griffith’s SF and the IRB. Very informative article. Many thanks. Where can I get more information on this? What’s the definition of “landed estate” being used here? Thanks Michael. the best book out on this is ‘The Land for the People’ by Terence Dooley, which I highly recommend. I also hope to have an article up on this on The Irish Story at some point. Re the definition of the Landed Estate as far as I can make out, in the 1923 Land Act this was defined as land owned by a landowner in excess of 200 acres but worked by its tenants. Compulsory purchase was implemented in 1923 where the tenants’ plots were worth ten pounds or less. I would see those examples more as a case of tinkering with the system, as every government that isn’t completely stagnant or reactionary tries to do. Irish Nationalists weren’t completely divorced from the social issues around them, but then neither was Irish Nationalism overly concerned with them on general principle, certainly not to the point that you could classify one Civil War side or the other as counter-revolutionary like you could in Civil War Russia. Ah I see you were responding to previous comment. About ‘counter revolution’, two points, the Irish revolution was primarily a political revolution – ie for Irish independence. The Treaty was certainly a step backwards from this principle – though arguably it brought the practicality closer. But if we’re talking about revolutionary theory, I’d say the civil war was closer to ‘Thermidor’ (the triumph of moderate over radical revolutionaries see here http://books.google.ie/books?id=30EEq8R2feIC&pg=PA715&dq=thermidorian+reaction+theory&hl=en&sa=X&ei=HZuKUbD6LIanhAeFwYBI&ved=0CDYQ6AEwAg#v=onepage&q=thermidorian%20reaction%20theory&f=false) than ‘counter revolution’. The pro-Treatyites didn’t want to turn back the clock to 1912, they wanted to consolidate the concrete gains of 1919-21. The other point is that economic issues were not at the heart of republican thinking at the time, but they were so grave by 1922 (people were actually in danger of starvation in some areas) that they had to play a part in the civil war. The anti-Treatyites made some noises about adopting socialistic measures but never did it. But on the other side, the pro-Treatyites made a determined effort to stamp out what they called ‘social disorder’. A new Army unit the Special Infantry Corps was even raised for this purpose. On the issue of ‘moderate’ vs ‘radical’ revolutionaries, I was reading John M. Regan’s “The Irish Counter-Revolution 1921-1936,” where he discusses the Dail debates behind the Treaty and goes into how many of the men present who had intimate knowledge of the previous fighting were for accepting the Treaty, such as Sean Mac Eoin, Eoin O’Duffy, Sean Hales, Paddy Brennan and, of course, Michael Collins, based on their knowledge of how thinly-stretched the IRA resources were and how long they could realistically expect to hold up to another war (pp.46-47). Of course, many who opposed the Treaty such as Sean Moylan, Tom Barry and Cathal Brugha had just as much experience, so it seems to be me unfair to boil it down to whoever knew what they were talking about but interesting points to consider, all the same. Yes, there’s lots of contradictions there alright. What really complicates the civil war split is that there is an impeccably militant republican faction on the pro-Treaty side in Collins, Mulcahy, MacEoin, O’Duffy et al. Nevertheless, broad brush, people like Cosgrave, O’Higgins, Griffith, Blythe etc were moderates, who wanted no more revolution, either national or social. And if you look at the social base they represented – big farmers, business, ex unionists, this is true as well. So there’s definitely something in the ‘thermidor’ or counter revolution analyses. Carney was himself ex-British Army from the WWI period and an Irish Republican Army veteran of the War of Independence. He went on to be a TD for Donegal and was well respected in his time. His testimony seems quite unambiguous on the matter of direct British military support for the Free State regime. thanks john dorney for a great article and website, fair play to frank carney (whoever he was) that an sionnach fionn mentioned there. pity collins didnt realise the treaty was a stepping stone to a cesspit of skullduggery, gombeenery, sleeveenery, shoneenism and treachery. weve been goin backwards ever since but the irish keep voting for the same shameless goons. u get what u deserve. the freestate army, only army in the world that never went to war and half of them went deaf. sounds like they needed brit aid alright. John. With your knowledge, do you really think that if paddy Daly Joe Leonard and paddy o Connor ,thought there was British involvement in the attack on the four courts that they would have not turned their force on them. All the commanders of the artillery were national army me. Phil cosgrove, peader mcmahon, Doyle and Tony lawlor. What was the connection or what reference was the shooting of miss kathrine wright and the attack on the four courts. Does it matter if paddy o Connor was involved in the accidental shooting of one lady or six. What point are you trying to make. Diarmuid o Connor author of Sleep Soldier Sleep a book you have chosen for reference. Diarmuid, with regard to the first question I don’t know what they would have done. I do know that leaving aside Creek’s memoir, British forces did play a part in National Army operations in Dublin during the Civil War – aside from supplying arms and artillery – which was the main point of this article. With regard to the second question, the point I was trying to make was that the likes of O’Connor had been committed IRA fighters a year before – attacking British forces wherever possible, in including, as at the Trinity attack where they were off duty and surrounded by civilians. In other words, despite anti-Treaty rhetoric that they were British stooges, they had been just as militant as those on the other side of Treaty split. That is why I mentioned the Trinity attack. James I don’t remember what happened or who requested what five years ago and I’m not going to reopen what ever debate you were having then now, based on what someone said on facebook.